AKIPRESS.COM - Another unusually harsh winter in Mongolia that's decimating livestock and sending temperatures to minus 56 degrees Celsius (minus 70 Fahrenheit) may create a humanitarian crisis, with worse conditions still to come, aid groups warn, reports The Associated Press. Save the Children and the International Federation of the Red Cross said Wednesday that this winter will likely see vast swathes of the Mongolian steppe affected by the extreme weather phenomenon known in Mongolia as "dzud." A dzud typically happens once a decade but could strike for the second consecutive year. The dzud last year killed more than 1 million animals, afflicting the majority of Mongolians who depend on livestock for food, milk and income. The Mongolian government said last week it met with international organizations including Save the Children, the Red Cross and the United Nations Development Program to discuss efforts to deliver heating, fuel and medical supplies amid "worsening" conditions and heavy snowfall since October. Aid groups say the situation is compounded by last year's harsh winter and a deep recession amid a market bust for Mongolia's mineral exports. The country is struggling to repay debt with its hard currency stocks while household savings have also evaporated. 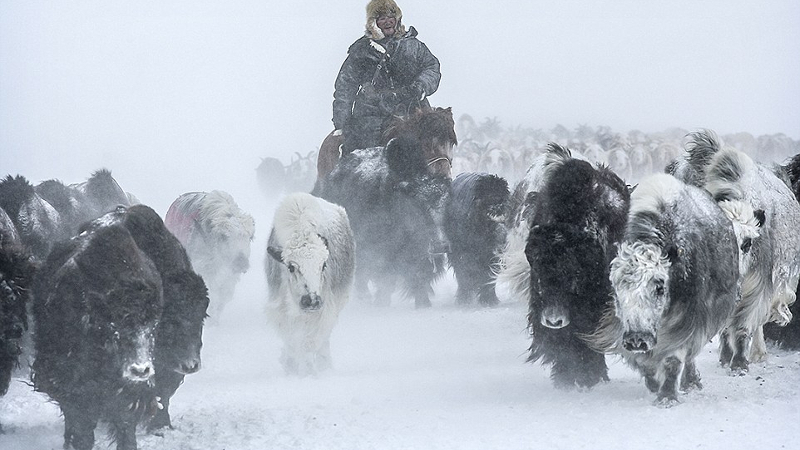 Red Cross disaster program manager in Mongolia Davaajargal Batdorj said more livestock deaths are expected this year with far northwestern areas of the country already buried under 1 meter (yard) of snow. The organization will begin sending cash to herder families in the far west in the coming weeks. "It's a natural disaster on top of an economic crisis," Davaajargal said. Government agencies have adopted all-hands-on-deck measures after officials declared a "white dzud" status with heavy snowfall in parts of nine provinces last month. The mayor of the capital, Ulaanbaatar, has ordered government workers to shovel snow from the city and surrounding areas with the help of soldiers and high school students, according to local media. Save the Children has urged the government to make a formal public appeal for international aid. "The sooner the assistance comes, the better," said Save the Children spokeswoman Khulan Munkh-Erdene.